After the few weeks leading up to Sanctuary Cove 2012 and the associated planning, setting up and returning to Sydney, today see’s the first week of a near normal week. After spending yesterday setting up the stands again in the warehouse as a prelude to th Sydney International Boat Show where DeckHardware will have a larger and improved stand on Sydney 2011. Sanctuary Cove was an improvement on last years show with many if not most of the visitors to our stand knowing what they were looking for. As in every year, Man Ship Marine’s range of hatches and ports was the most requested product, it was surprising to see a larger number than usual of owner builders requesting information. They ranged from those who had plans, one fellow was on to his second hull in his catamaran build to a fellow from Victoria who had just turned over his Van DeStadt to start on the interior and deck. Now with an increasing range of products, DeckHardware can supply product information across a range of enquiries, from the Forespar Marelon plumbing products to the TBS non skid for their decks. 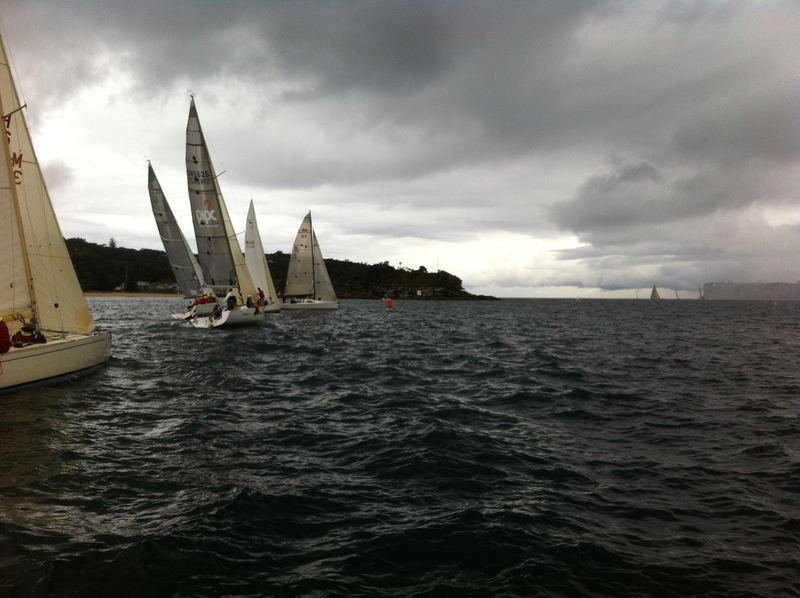 Saturday was the first day back on the Middle Harbour startboat in some time. This was race 5 of the Winter series and I had missed the last race of the summer pointscore whilst Melissa and I attended a YANSW course. The photo shows Division 2 with 10 seconds to go, not showing is the one boat who was OCS, in Winter I try to lay a line that makes the fleet start down the line, but they still start on the boat and give away too many boatlengths. And the rain in the distance over South Head? Yes, we got wet! I flew in to Perth Western Australia last Sunday morning and after a bit of getting organised, drove up to Geraldton some 5 hours north of Perth. Gero as it is known to the locals is home to a large cray fishing fleet, hence my trip up there to see those in the marine industry. Unfortunately there are now heavy restrictions on them via quotas and the fleet is reducing rapidly. Monday was spent seeing all the chandleries and retailers before driving back to Perth. Tuesday saw a shorter drive north up to Yanchep and the Two Rocks Marina where Alan Bond started his Americas Cup campaign in the early 1970s before working my way south in the northern suburbs of Perth itself. All of the streets in the area are named after the various Americas Cup contenders. Wednesday was spent in Fremantle and Perth city seeing all the chandleries and sailmakers that DeckHardware supplies. Each trip interstate I carry a range of both the new lines and some of the more popular existing lines to ‘jog’ their memories on some of our range. At 1800 the Cunard cruise liner Queen Mary2 left the port of Fremantle and I was one of several hundred to watch her leave. 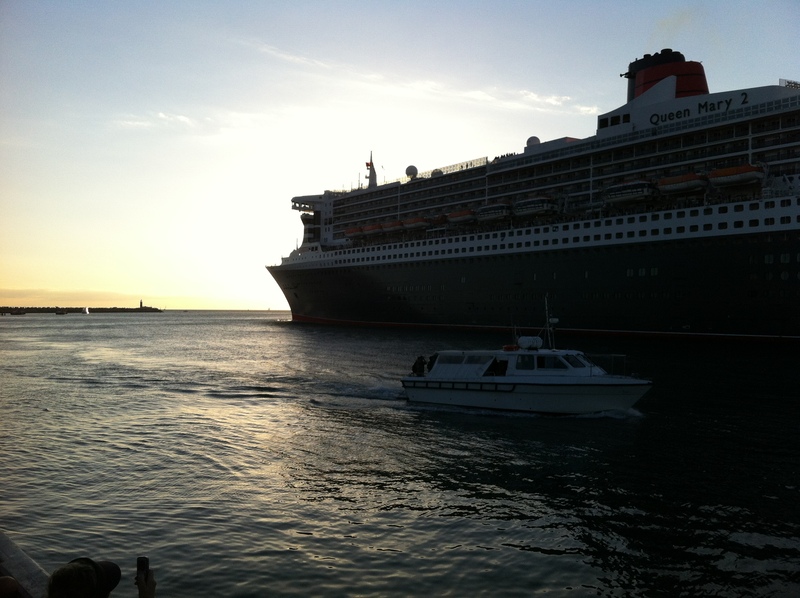 As you can see see, the QM2 is rather large, especially on the confined waters of the port, where the World Womens match racing was held last December. Thursday was spent seeing those south in Bunbury, several hours drive south of Perth with Friday finishing off with those in Mandurah and Henderson. In the course of the week and just over 2000kms on the road I saw some forty new and existing DeckHardware customers, next week will see me driving once more to Brisbane and the Gold Coast, usually on these trips and those south to Victoria [ coming up at the end of the month] I see around 100 customers in the week. Hopefully the deluge that the East Coast of Australia in recent weeks will have receded somewhat and allow me to get through without any issues. This Sunday I am off to Perth for a week of visiting Chandleries, Boat Builders, Sail makers, Riggers and Marinas. For those who wish to see our new products who live over that way send me an email phil@deckhardware.com.au or give is a call in the office on 02 9905 9400. I can’t wait to show off all the new brands in particular Sanol, TBS and Drainman! I will be travelling between Bunbury and Yanchep seeing as many people as possible in that time. I will also be catching up with friends whilst over there. A big thanks to Paul Eldrid for putting up with me yet again. The fun part is trying to pack the suitcase and fit in everything I want to bring over to show. I have already sent a box of catalogues and discs ahead of me with the couriers. See you all in Perth!